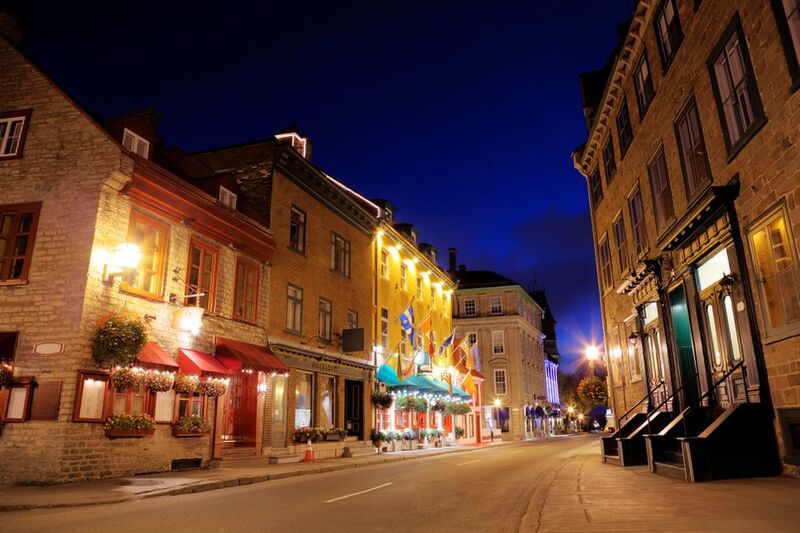 Although Quebec City only has a couple of true gay bars (along with three gay saunas), this festive and very social city has no shortage of inviting hangouts that cultivate a mixed gay-straight following, everything from craft breweries to wine bars to romantic restaurants. One neighborhood where you really can't go wrong in terms of positive energy and LGBT diversity is St Jean, specifically along Rue St-Jean, where you'll encounter dozens of gay-popular eateries, especially as you head west from Avenue Honore Mercier for several blocks. Inside the historic Old City and down in Lower Town amid the design hotels and often quite fashionable and romantic eateries rue St-Paul and rue Saint-Vallier E, you'll also find plenty of wonderful spots. And down the hill from the St Jean district in the lively Saint-Roch neighborhood, on the blocks near the campus of University of Quebec (especially where rue de la Couronne intersects with rue St-Joseph E), you'll also find a slew of hip and often arty cafes, bars, and restaurants that pull in plenty of LGBT patrons. Here's an alphabetical list of some notable places for drinking, eating, and mixing it up with both locals and tourists, gay and straight. Just a block away from the city's much larger and more famous Le Drague gay club, cozy and laid-back Bar St-Matthew (889 Cote Ste-Genevieve) tends to draw a cruise-y and predominantly male crowd. Although all kinds are welcome here, you'll encounter more bears, otters, leather dudes, and guys on the make here than at Le Drague. Although not a gay establishment per se, Bar Le Sacrilege (447 rue St-Jean) is one of the most LGBT-favored nightspots in the city, with a convenient location along the hip and inviting rue St-Jean. There's a quite good selection of beers (including many craft varieties), live music is offered some evenings, and there's seating on a lovely garden terrace out back. On the busy corner of Honore-Mercier and rue St-Jean, cheerful and affordable Bistro L'Accent (810 ave Honore-Mercier) has long been a go-to in the Quebec City gay community for breakfast, lunch, and dinner - or even late-night snacking, as this buzzy hangout is open daily until 10 pm (and until midnight during the warmer months, when it's also ideal to grab a seat on the terrace). Hungry in the morning after a night of dancing and drinking? Come by Bistro L'Accent for breakfast - everything from healthy "organic platters" with fruit and eggs to rather more decadent Atlantic salmon eggs Benedict or crepes maple, caramel, cooked apples, and cheddar. Evening fare includes an array of traditional diner-pub favorites, including beer-barbecue chicken wings, Tex-Mex nachos, cheeseburgers, pizza, mussels and fries, and - a local tradition - brown-sugar pie. It's more about the atmosphere than the cuisine, but Accent is a solid option when you're hungry and wanting to dine near the city's gay bars. Beer and wine are served, too. Always lively, festive, and drawing a real mix of regulars and tourists from throughout the surrounding St-Jean neighborhood, Fou-Bar (525 rue St-Jean) - which is a loyal supporter of Quebec Gay Pride each year - is a dark and homey spot with quirky decor (everything from disco balls to offbeat artwork), brick and stone walls, and clusters of cafe tables from which patrons watch and listen to jazz bands many evenings. Brulerie St-Jean (881 rue St-Jean) is part of a small Quebec City chain of funky and friendly coffeehouses, all of which are quite popular with the LGBT community. But this location on rue St-Jean is especially frequented by gay folks, as is the Brulerie St-Roch (375 rue St-Joseph), which is down the hill in the trendy district of the same name. These casual hangouts are open late (till 11 pm or midnight, depending on the night of the week), ​serving casual lunch and breakfast fare (including cakes, pastries, sandwiches, and quiches). The exposed stone walls of the St-Jean branch lend a particularly cozy vibe. Most locations, including the St-Jean and St-Roch branches, have outdoor seating. Set just a block off of fashionable Rue Saint-Jean a short way west of the Old City wall, La Drague Cabaret Club (815 rue Ste-Augustin) has been the premier gay dance club in Quebec City for years, outlasting quite a few neighborhood gay bars that have come and gone over time. Le Drague is a large club with an attractive outdoor terrace that's typically packed in summer, an impressive dance bar and well-designed cabaret (with a large stage) on the inside ground floor, and a hip, recently redesigned cocktail bar on the upper level. There's pretty much something for everyone here, and the drag shows staged in the cabaret are some of the best in Canada. As this is the city's main gay venue, Le Drague tends to draw a very eclectic bunch, from young and pretty students to lipstick lesbians to friendly straights to older men and women - everybody is made to feel quite welcome here.